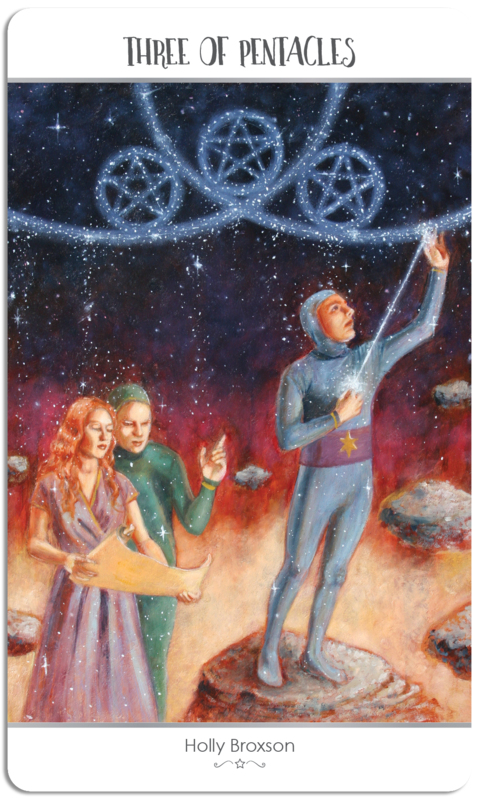 In my interpretation of the Three of Pentacles, there is a team of three working together and contributing their efforts. The builder on the right is using a substance that emanates from his heart into the archway above. The two figures on the left are deciphering and discussing the project as they look at the blueprints. There has been a lot of planning and things are paying off, but there is still much to do. We see the bottom of the vesca pisces, located at the top of the composition, which symbolizes the doorway to the heavens. It also contains the three pentacles echoing the meaning of the card, the work of the three figures, and their creation of the astral plane and the gateway to it. A group of three hard workers are weaving the stars in space. Two are working on the blue-prints, checking the current work against their plans, and developing ideas for the next stage, while one puts his all into the job at hand, spinning his very soul into his work, creating beautiful imagery. They are content and secure in each other, and their skills; they do not hover over each other, but are content to each bring their own skillset to the work. Three pentacles hang, resplendent and stunning, but they are but three in a galaxy…while progress has been made, there is a lot more work to be done. This entry was posted in Artist, Deck Review, Featured Card of the Day, General Tarot, Readings and tagged 3 of Pentacles, 78 Tarot, Astral, Tarot.